Hoyt Street is a street within the Elmwood Village neighborhood of the West Side of Buffalo. The street runs between Ferry Street and Forest Avenue, parallel to Elmwood Avenue and Grant Street. Interestingly, there was historically an earlier Hoyt Street. The original Hoyt Place was located west of the Buffalo State Hospital (now Richardson Complex) and is now known as Bradley Street. The street was renamed likely around the same time that the Hoyt Street we know today was developed, during the 1880s. 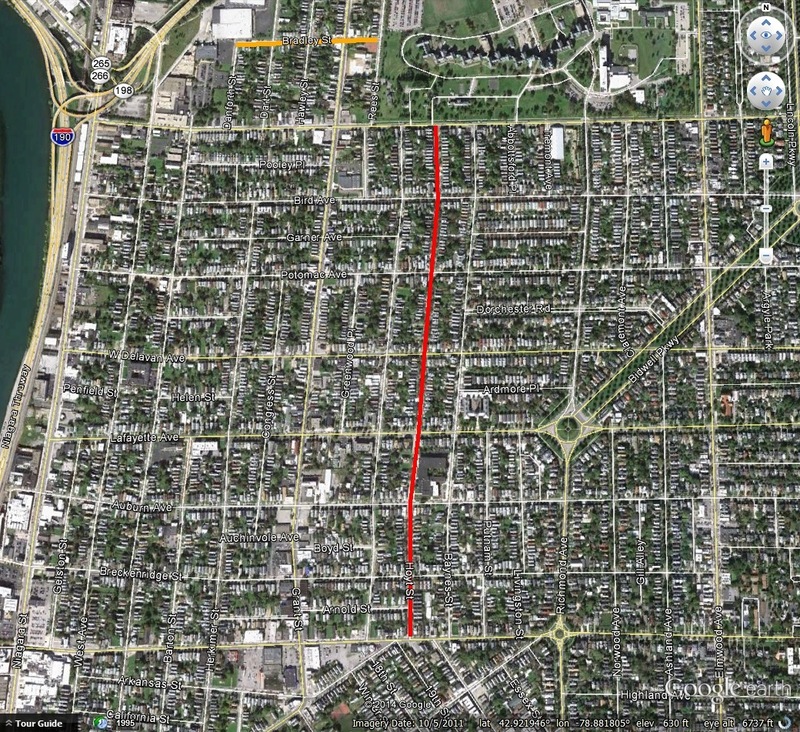 Bradley Street is shown in orange on the map to the left, while Hoyt Street is shown in red. The historic Hoyt Place was named after Joseph Dibble Hoyt, the original land owner of the property Hoyt Place/Bradley Street was developed on. Joseph Hoyt was born on December 23, 1785 in Danbury, Connecticut. He was the child of Moses Hoyt and Amerillas Dribble. In 1811, he moved to Buffalo, NY. During the War of 1812, he was taken prisoner of war during the Burning of Buffalo by the British and Native Americans. He was imprisoned in Montreal. After the war, he returned to Buffalo and became a prominent and influential citizen. Mr. Hoyt owned a tannery on Carroll Street, which was originally called Tan Alley because of the tannery located on it. 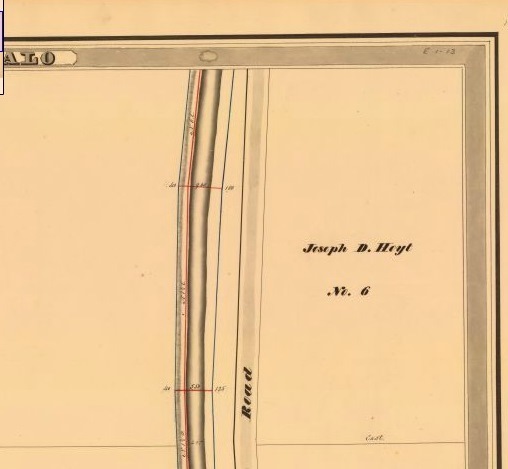 Mr. Hoyt married Sarah St. John in 1809, they had one child, Harriet Hoyt. He later married Polly Wright in 1814. Mr. Hoyt died in 1838 and is buried in Forest Lawn. I’m not sure that these Hoyts are related to Buffalo’s other Hoyt family, but perhaps someone more familiar with the family’s genealogy would be able to say for sure. Hoyt Street is named after William Ballard Hoyt. 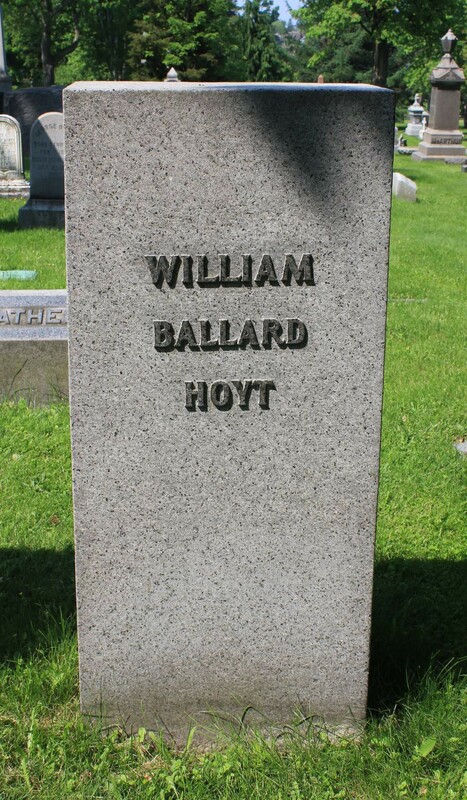 William Hoyt was born in East Aurora on April 20th, 1858. He was the son of Doctor Horace and Josephine Ballard Hoyt. He attended the Aurora Academy and Buffalo High School. In 1877, he entered Cornell University to study history and political science. After graduation, Mr. Hoyt came to Buffalo and entered the firm of Humphrey and Lockwood. 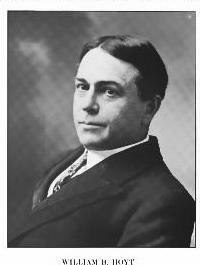 He was admitted to the bar in March 1883, and the firm became Humphrey, Lockwood & Hoyt. The firm went by several different names as partners changed. Mr. Hoyt and his firm served many prominent industrial and business concerns in Buffalo, such as New York Central, Vanderbilt properties, Western Union Telegraph Company, Western Transit Company and others. Along with Mr. Baynes (more about him on a different day), Mr. Hoyt developed several of the streets around the street that bears his name. In 1886, Mr. Hoyt became Assistant United States Attorney for the Northern District of New York, serving in this position until 1889. In 1894, he was appointed as counsel to the United States Interstate Commerce Commission for the States of New York and Ohio. Mr. Hoyt served as Director of the Buffalo Club for six years, Curator of the Buffalo Library for three years, and was a member of the Board of School Examiners and President of the Cornell Alumni Association. In 1887, Mr. Hoyt married Esther Lapham Hill. The Hoyts had five children – John, Josephine, Esther, Albertine and Hilda. Mr. Hoyt died in 1915 and is buried in Forest Lawn Cemetery. Mr. Hoyt’s son Captain John Davidson Hill Hoyt was born in 1898 in Buffalo. Captain Hoyt served in the Air Corps US Army. In 1936, he served as president of the Buffalo Niagara Association of Realtors. He was killed in a crash off the coast of the Hawaiian Islands along with nine other crew members in January 1943. Captain Hoyt has a marker among the Courts of the Missing from WWII in Honolulu and also a marker in Forest Lawn Cemetery. 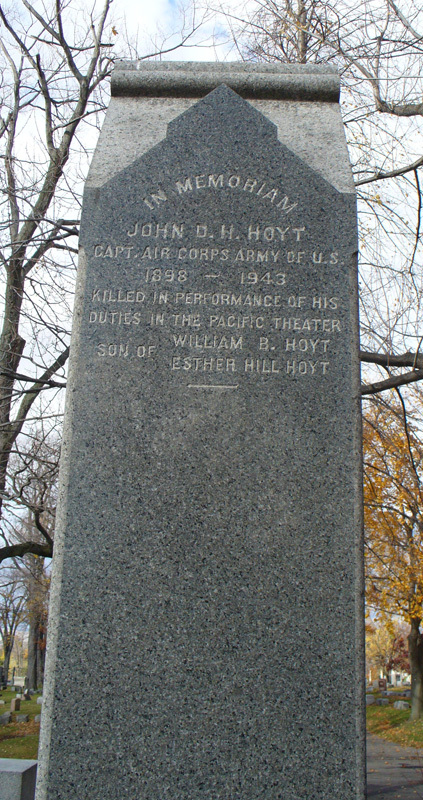 Captain Hoyt’s son William B. Hoyt II was born in 1937 in Buffalo. He was educated at the Park School of Buffalo and Hamilton College. He taught history at Park School for 11 years before entering politics. He served as a member of Buffalo Common Council from 1970 to 1974. William II ran unsuccessfully for Mayor of Buffalo in 1989, when he was defeated by James D. Griffin. 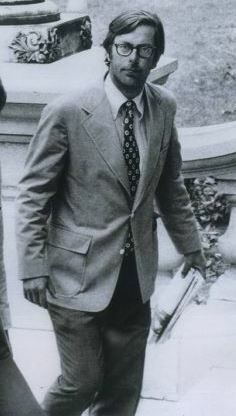 He served as New York State Assemblyman for the 144th District from 1974 until 1992. Mr. Hoyt died of a heart attack on the Assembly floor during a vote. During his time on the Common Council, Mr. Hoyt proposed a plan to clean up the lake in Delaware Park. He became a champion for the Lake. 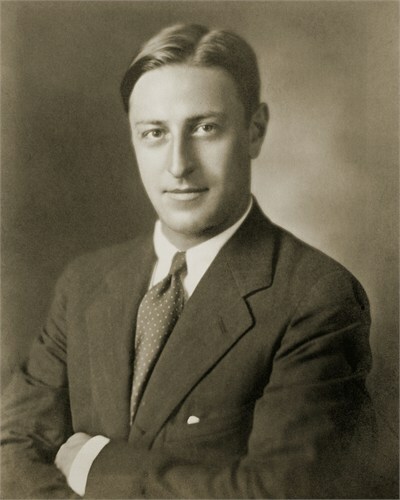 Following his death, the lake was named Hoyt Lake in honor of William B. Hoyt II. William II’s son, William B. Hoyt III, known by most Buffalonians these days as Sam Hoyt, was born in January 1962. Sam Hoyt attended local schools, graduating from Park School of Buffalo and attending Buffalo State College for political science. Sam served as the WNY regional director for U.S. Senator Daniel Moynihan and director for the Buffalo Bisons. In 1992, he took over the 114th District of the New York State Assembly, filling his late father’s seat. 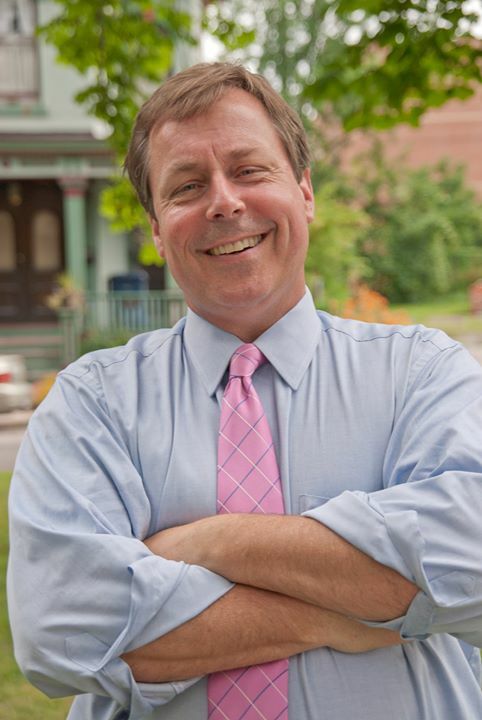 He served in the Assembly for nearly 20 years prior to resigning in 2011 after being appointed as Regional President of the Empire State Development Corporation. He also serves as Chair of the Buffalo and Fort Erie Peace Bridge Authority. Think of the various generations of the Hoyt family the next time you go for a walk down Hoyt Street or take a walk around Hoyt Lake. Maybe in a few years, I’ll have to update this entry to write about Sam’s sons! Check out the Street Index to learn about other streets. A History of the City of Buffalo: Its Men and Institutions. Published by the Buffalo Evening News: Buffalo, 1908. Our County and its People: A Descriptive Work On Erie County, New York. Edited by Truman C. White. Boston History Company: 1898. Buffalo Past and Present: A Manual of Buffalo and the Niagara Frontier. Reinecke & Zesch: 1994. Downs, Winfield Scott. Municipality of Buffalo, NY: A History. 1923. Memorial and Family History of Erie County, New York. Genealogical Publishing Company. 1906.